The Estate Agent Association of India has fixed the following uniform SCHEDULE of Rates of Commission for its members, payable by their clients on different types of transactions handled by them. (a) Where a member acts for both the Buyer and Seller, Commission at the rate of 2 % each shall be paid by both the Buyer and Seller. (b) Where a member acts only for the Buyer or the Seller commission at the rate of 2 % shall be paid by the party for whom the member acts. (c) Where there are more than two member involved in the deal, the Buyer and Seller shall pay 2% each, which will be shared amongst the member involved in the deal as per their mutually agreed terms. (a) Commission equivalent to two months compensation/rent/license fee, shall be due and payable by the License/Lessee to the member on premises secured on the leave and license basis for first period of eleven months Thereafter additional amount equivalent to one months compensation / rent shall become due and payable to the members from the Lessee / Licenses as commission for every additional renewal period of 11 months or part thereof as the case may be. 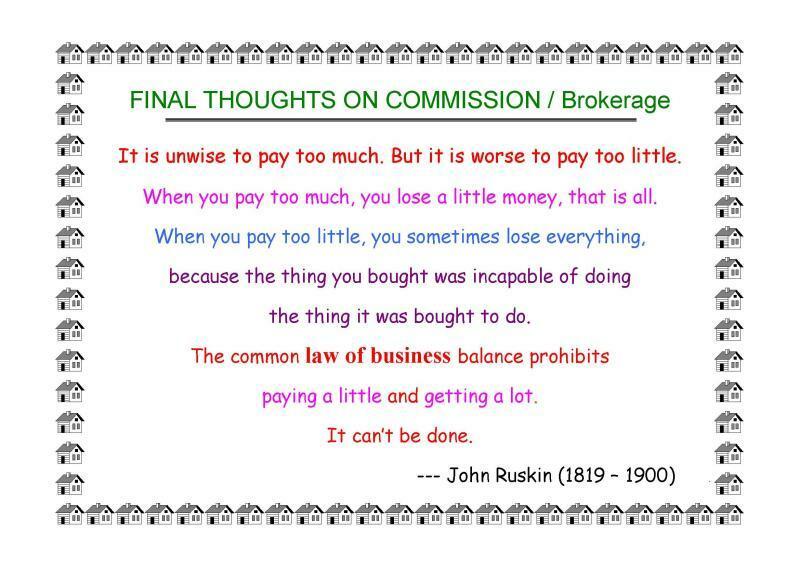 (b) Similarly Lessor/Licensor shall pay brokerage equivalent to one month rent / compensation / license fee. Thereafter additional amount equivalent to half months compensation / rent shall become due and payable to the member from the Lessor/Licensor for every additional period of 11 to 12 months or part thereof as the case may be. Commission equivalent to two months compensation shall be payable by Paying Guest / Francisee / The person/s taking the premises or as the case maybe, to the member and the Owner shall pay commission equivalent to one months compensation. All the commission shall become payable to the member by the Purchaser/Seller/Licensee/Owner, as the case may be at the time of the execution of the agreement and / or at the time of handing over or taking over the possession of the accommodation / premises whichever is earlier. Section 116 of the Finance (No. 2) Act 1998 provides for levy of Service Tax on the services rendered by Real Estate Agents and Real Estate Consultants, vide Notification No. 53/98-ST yo 58/98-ST dated 7th October 1998, this has come into effect from 16th October 1998. Currently the Rate of Service Tax on Realty Services is 12% and there is an Education Cess of 2% plus Higher Education Cess of 1% on the Service Tax paid. This Rate is applicable as on 14th October 2014 and can be revised by the Government from time to time.